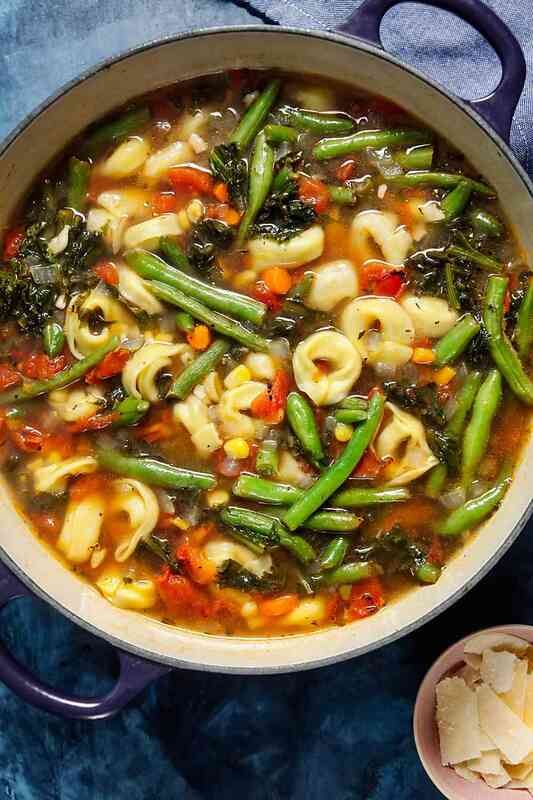 This easy tortellini vegetable soup is chock full of fresh produce and can be on the table in under 30 minutes! It isn’t much of a secret that I’m obsessed with soup. Most people think of it as a wintertime food, but I love to make it all year round. 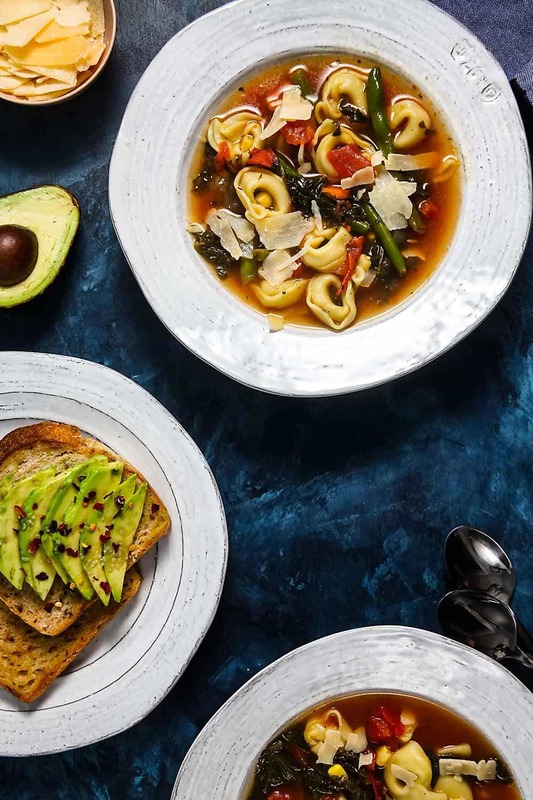 Believe it or not, summer is actually great time to make soups because you can load them up with fresh, in-season produce. 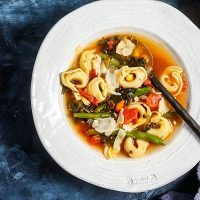 This time of year, I especially like brothy soups like this quick and easy vegetable tortellini soup, full of green beans, sweet onions, escarole, and carrots or my lemon chicken soup with tortellini. I’m sharing this recipe today in support of the annual Produce for Kids campaign in support of Feeding America. You might remember this campaign from last year, when I shared my Southwest Barbecue Chicken Salad. 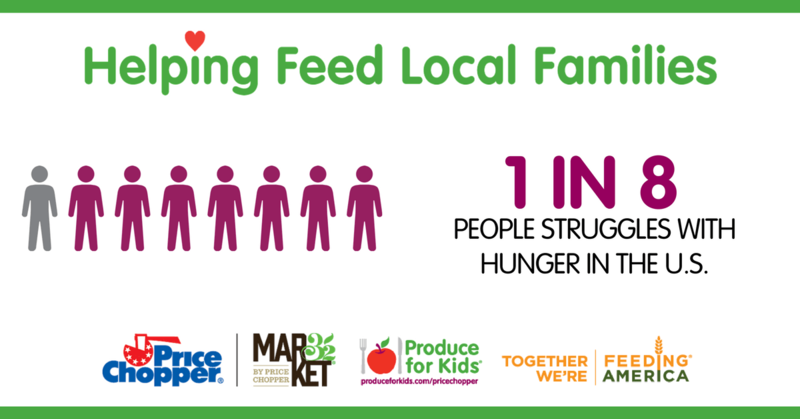 The campaign is taking place at Price Chopper/Market 32 now through July 24, and you can help give back to Feeding America programs in your community by purchasing sponsor products – including Avocados from Mexico, Eat Smart vegetables & salads, Fresh Express salads, Vidalia® onions, and Setton Farms pistachios. To date, the campaign has raised nearly $12,000 (125,000 meals!) for Feeding America food banks throughout the Northeast. Be sure to visit the Produce for Kids site for more information on their mission to bring the produce industry together to educate families about healthy eating and raise money for local organizations that seek to end childhood hunger. You can also follow them on Twitter and Instagram. I follow both, and they have tons recipe ideas and healthy eating information. Instead of creating my own new recipe in support of Product for Kids, I decided to recreate one of the recipes that they have on their site. Of course, I couldn’t help but put my own spin on things! 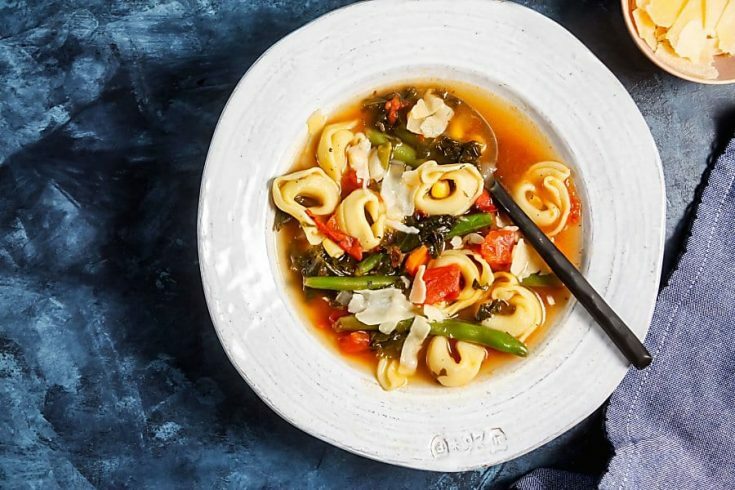 I upped the flavor by using fire-roasted tomatoes and adding oregano, basil, and extra garlic; swapped vegetable broth for chicken broth, and substituted frozen tortellini for dried (mainly because I couldn’t actually find dried). I also used shaved parmesan instead of grated, because I love the way it melts. 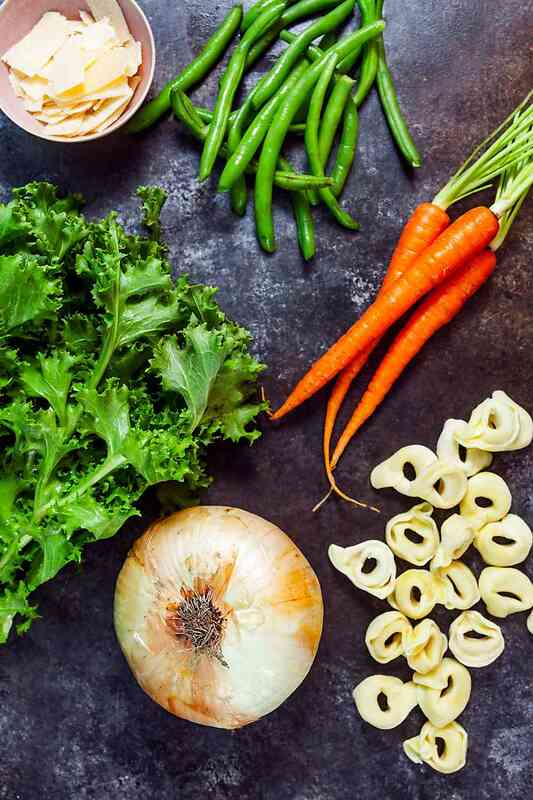 To make the soup, start by sautéing garlic, onions, celery, and carrot in a little but of olive oil. Once they’re nice and soft, add the tomatoes, broth, escarole, corn, beans, and spices. Bring everything to a boil, then simmer it for about 10 minutes to let the flavors meld and the green beans cook. Once the beans are soft, add the tortellini and cook a few minutes longer to warm it through. Serve the soup topped with cheese and season to taste with salt and pepper. Yum! Heat oil in large pot over medium heat. Add garlic, celery, onion and carrots. Cook 5-10 minutes, or until tender. Increase heat to high; add broth, tomatoes, escarole, green beans, corn and spices. Bring to a boil. Reduce heat and simmer 9-10 minutes, or until vegetables are tender. Add tortellini and cook 3-5 minutes, or until cooked. Top with cheese; season to taste with salt and pepper. This recipe is adapted slightly from one that originally appeared on the Produce for Kids site. Don’t you love Produce with Kids?? Such a fabulous campaign to be a part of! 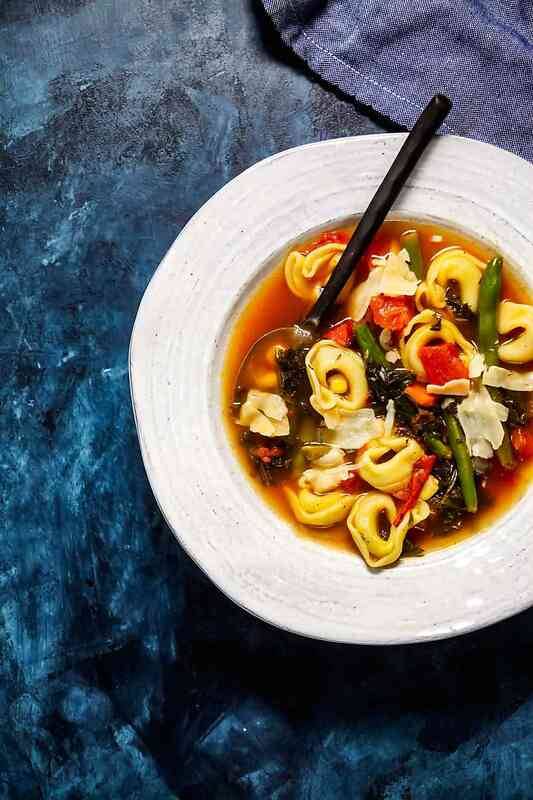 And love this soup! Yes! I’m always happy to help spread thw word about them. Love their mission!